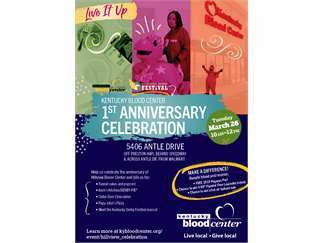 Join us March 26 to celebrate our Hillview Blood Donor one year anniversary. We will have free popcorn, funnel cakes, derby pie and pizza. Cellar Door chocolates, the Kentucky Derby Festival mascot and staff will be present along with a strawberry hot air balloon.